Although law enforcement officials seldom ticket pedestrians for jaywalking, this behavior does pose a significant safety risk. 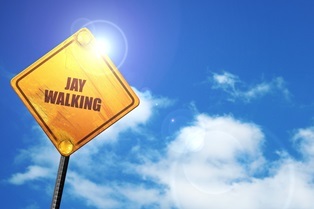 A jaywalking pedestrian can suffer broken bones, internal bleeding, and brain or spinal cord injuries. If you were struck by a car while jaywalking, Louisiana law still allows you to file a personal injury claim. However, you will likely be found partially at fault for the accident. The first step in any personal injury case is determining who is liable for accident injuries. Louisiana RS 32:214 says, "Notwithstanding the foregoing provisions of this Part, every driver of a vehicle shall exercise due care to avoid colliding with any pedestrian upon any roadway and shall give warning by sounding the horn when necessary and shall exercise proper precaution upon observing any child or any confused or incapacitated person upon a highway." Since pedestrians are more vulnerable to injury than drivers in motor vehicles, the law recognizes that drivers have a duty to take reasonable steps to avoid a collision even if the pedestrian is illegally crossing the street. The driver may also bear additional blame if he was speeding, driving too fast for weather conditions, texting while driving, inattentive, intoxicated, ran a red light, or committed some other offense. However, since jaywalking is a violation of Louisiana's right of way laws, a pedestrian who is involved in an accident while jaywalking will likely be partially at fault unless age or disability limits his culpability. A partially at-fault party can still seek compensation for accident related injuries, so you should not be discouraged from recovering expenses if you were jaywalking. Louisiana uses a comparative negligence system for determining compensation in cases where more than one party is partially responsible. If you're partially at fault due to jaywalking, your settlement will be reduced by your assigned percentage of fault. For example, if you're determined to be 10% at fault for the accident, you'll receive 90% of what you'd be awarded if the other party was 100% at fault. The 10% deduction reflects your own liability for your injuries. Damages must be properly documented to be included in your case. You will need to provide copies of medical bills and pay stubs showing lost wages. If you're seeking compensation for future medical expenses and/or loss of earning potential, expert testimony will be required. Pain and suffering is typically calculated as a multiplier of your economic damages. Personal injury law can be complex, and insurance companies are typically in no hurry to offer injured pedestrians a fair settlement. To protect your right to compensation, it's best to retain legal representation as quickly as possible. There is a one-year statute of limitations for personal injury claims in Louisiana, and it will take your attorney time to prepare a solid case. Your attorney can gather evidence to prove liability, make sure your damages are properly documented, and maximize your settlement by negotiating a lower percentage of fault.